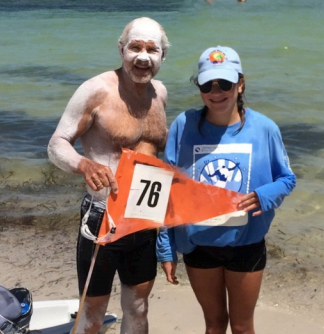 After completing his 75th Diamond Swim around Swim Around Key West in Florida, Bill Welzien is moving onward to a Century Swim. "Where is all this going? Swimming is incremental, just like all of life," mused Welzien. "In life, one decision leads to the next, one step leads to the next … and in swimming, one stroke leads to the next. When I began swimming around this island of Key West, I never – in my wildest dreams – imagined I would swim it 76 times. However, that is what I have now done. Swimming is incremental and it is cumulative." After his #75 'Snatching the Diamond' swim, Welzien started thinking about his next move. "I looked at my calendar and my eyes fell on the full moon on Monday, June 20th, the first day of summer. The tide looked good for that day, but appeared even better for Tuesday and Wednesday. The height of the high tide and depth of the low were identical. The only difference, tide-wise, was that I would begin from Smathers Beach at 8:30 am on June 22nd rather than 8:00 am on the previous day. Welzien convinced his 18-year-old daughter Jane to kayak for him. "She was a bit reticent to spend a major portion of her day sitting in a kayak, so I tried the bit about being a part of history. I must admit, that line has worn thin. I have been driven to bribery. My kids are demanding pay from their old father. As time goes on, my bribes are needing to become more and more lucrative. I recall the time when the promise of a steak sufficed. Now I am laying money on the table as the ante is being upped gradually and progressively." Jane has become a good, experienced kayaker. She has kayaked for me a few times now and kayaked for swimmer Paul Grassie in the 40th Swim Around Key West. So she knows the drill pretty well. Welzien prepared his drinks, zinc oxide sunscreen, disposable latex gloves, paper towel, numbered pennant, paddle, life jacket, swimsuit, goggles, GPS watch, and clothes for after and towels. "Jane covered me up thick with zinc and we entered the water. I took my first stroke at 8:35 am. The swim was pretty straightforward with the next swim already in the planning stages."